Lodge of instruction. Masonic learning in a friendly atmosphere. All Freemasons are welcome at the St Laurence Lodge of Instruction. Our Lodge of Instruction (LoI) is currently held on Tuesday evenings between 7:30pm and 9:30pm, generally from September to May in Rush Green, Romford, Essex. However, we do also meet monthly during the summer if brethren so desire. 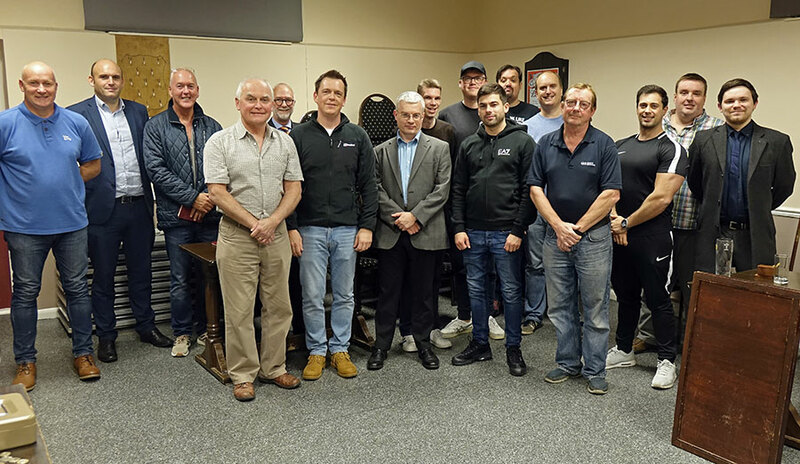 Below is a photo of those attending a Lodge of Instruction meeting on the 9th October 2018. We meet on an informal basis and practise the various rituals so that at our ‘actual’ meetings we feel confident and well rehearsed. There are always experienced brethren there to guide and instruct the newer brethren as necessary. The Lodge of Instruction is key to the guarantee of a good meeting of which the members can be proud and which hopefully gives pleasure to our visitors. The purpose of the Lodge of Instruction is to provide an opportunity for the younger Brethren to become versed in the ritual and symbolism of Freemasonry. Also to be able to practise the ritual in a relaxed and friendly atmosphere. The meetings are usually overseen by the Preceptor (another word for teacher) who is an experienced member of the Lodge. The rehearsal of a ceremony normally takes place with the officers of the regular Lodge occupying the positions they either hold or expect to fill next year. Lay brethren are also given the opportunity to fill any of the offices. This gives them a chance to practise a ceremony in an office which until then is unfamiliar to them. There are also opportunities for any brothers to practise any additional ritual or signs should they so desire (time permitting). Although, of course, the ceremonies are always practised in earnest to make sure we give of our best at the actual meetings, LoI could not be classified as a totally serious event and there is always a lot of fun and banter.